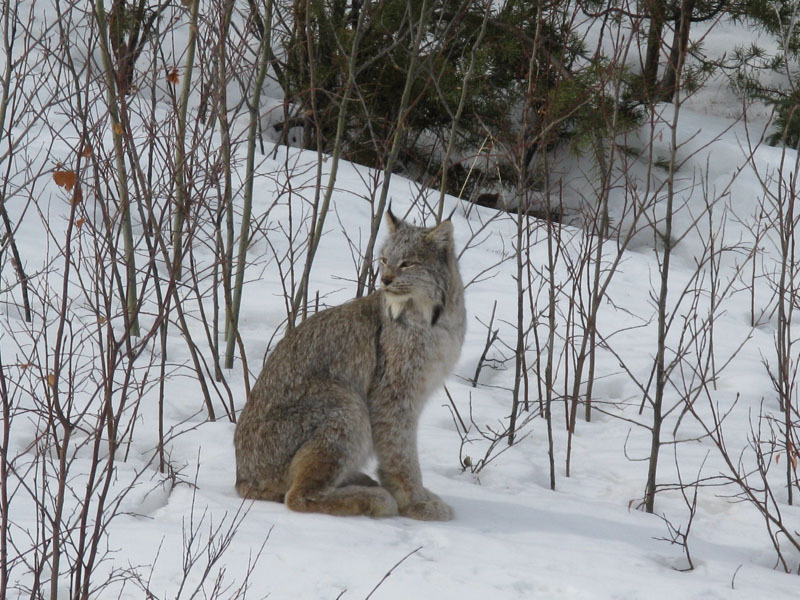 Winter is a big deal for humans in Canada, but it is even more so for our wildlife. 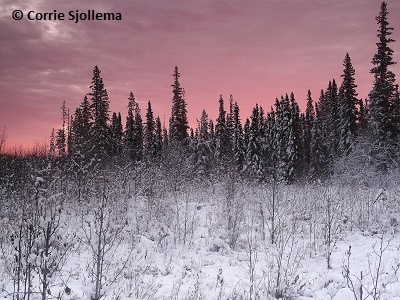 In high latitudes, winter is even considered one of the main driving forces behind evolution! Why? 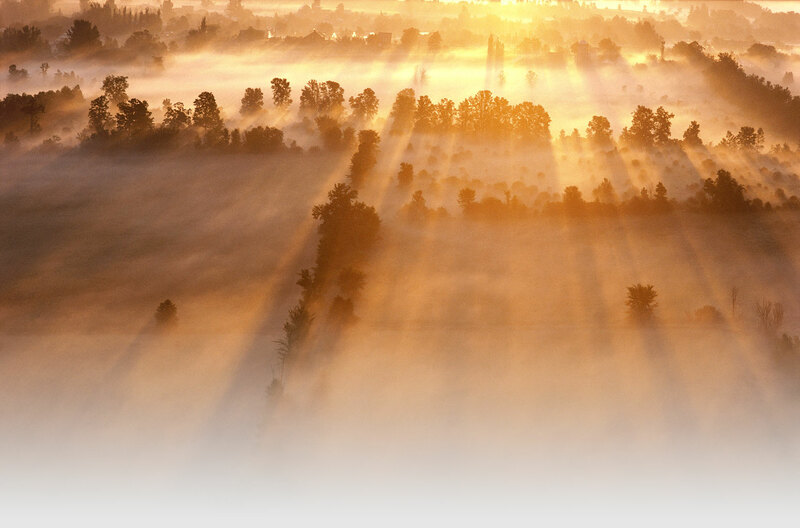 Because the amount of available energy is decreased compared with that of other seasons. The days are shorter, leaving less solar energy for plant life, and temperatures are lower, decreasing available thermal energy (heat) for all life forms. As growth and activity slow down, less nutritional energy (food) is produced and available for both plants and animals. These deficiencies make winter an evolutionary challenge; successful organisms must balance the impacts of winter on their energy supplies, managing to live and reproduce even when there is less energy around to sustain them during the cold months. Winter is indeed a major stressor for plants and animals. 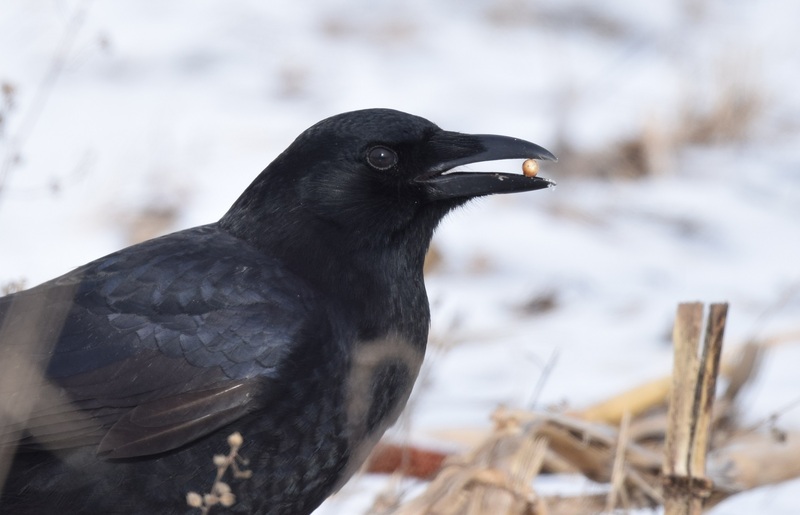 In areas where the effects of winter are predictable and consistent from year to year—which is the case for most of the country—wildlife has adapted and evolved in unique ways to survive seasonal changes while still calling Canada home. 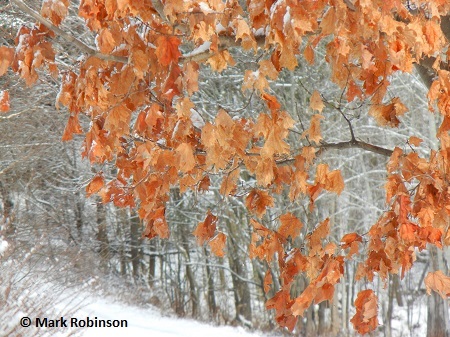 The cold season also has a significant impact on habitat. An obvious example is the changes to vegetative cover, such as the loss of leaves from deciduous trees that make a more open environment. Because of this, some summer habitats do not provide sufficient shelter from the cold winter air and wind. 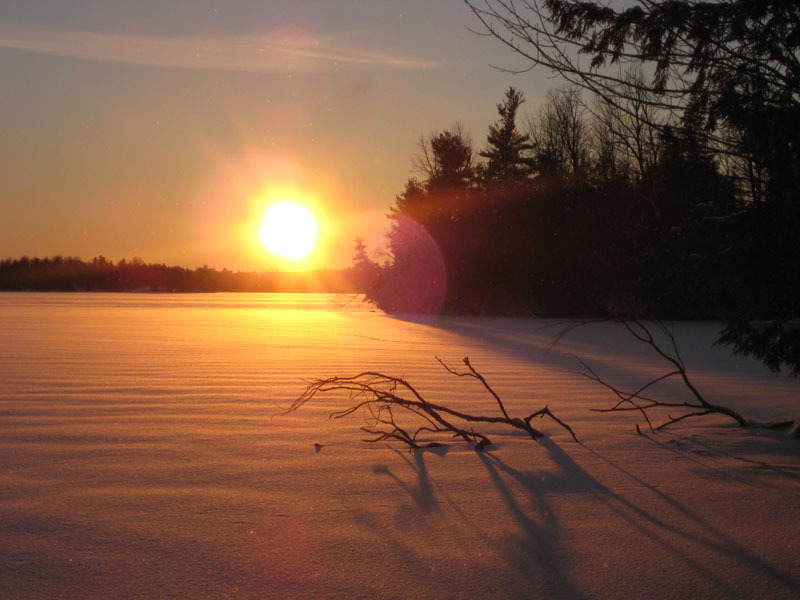 A layer of ground freezes and becomes inhospitable for some species. Ice covers aquatic habitats, creating a sheltered layer of stable-temperature water where less nutrients, energy and oxygen can enter. 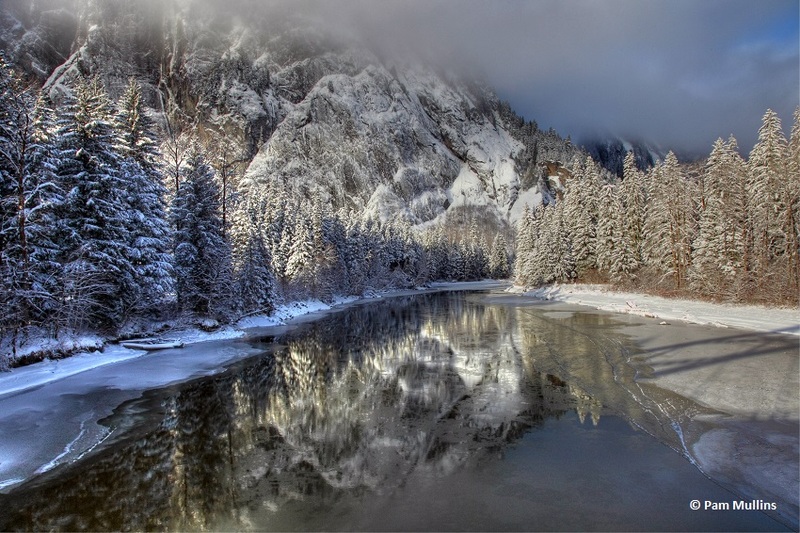 During cold winters with little snow cover, some shallow aquatic ecosystems can freeze all the way to the bottom—a major threat to the wildlife that live there. In a vast majority of larger, deeper lakes, the whole temperature profile of the water column changes. 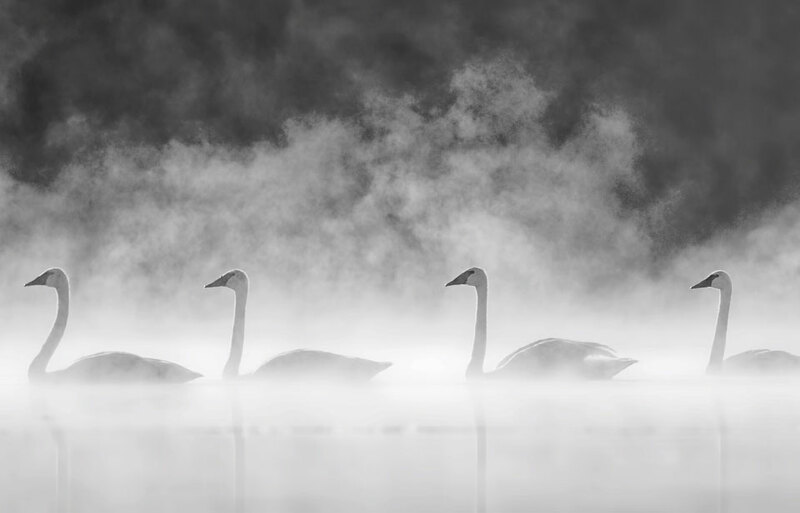 In the summer, colder water is found at the bottom of the lake, while in the winter this is reversed, as the water in contact with the cold air or ice becomes colder than the water at the bottom. 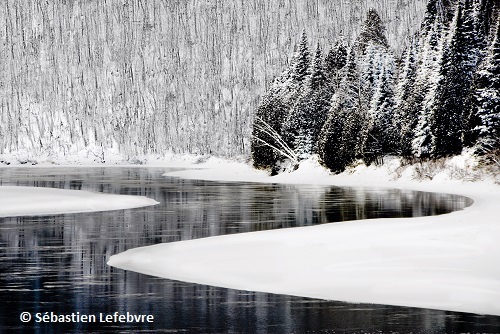 Snow of different types, thicknesses and densities covers terrestrial habitats and also changes the landscape. 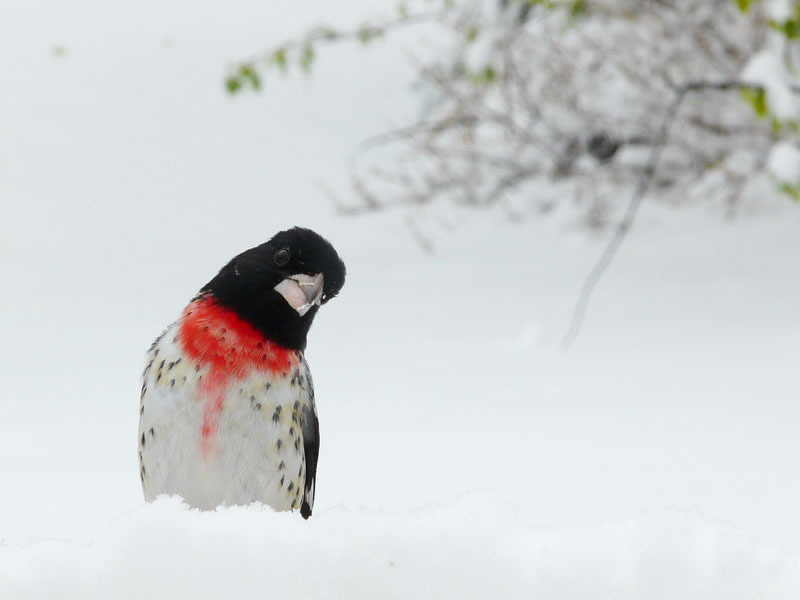 The presence of deep snow can affect the movement of some species, for better or worse. Snow can also provide a great shelter since it insulates the air from cold winds. Temperatures stay warmer in the layer right between the soil and snow cover, creating a new habitat that is vitally important for some species. 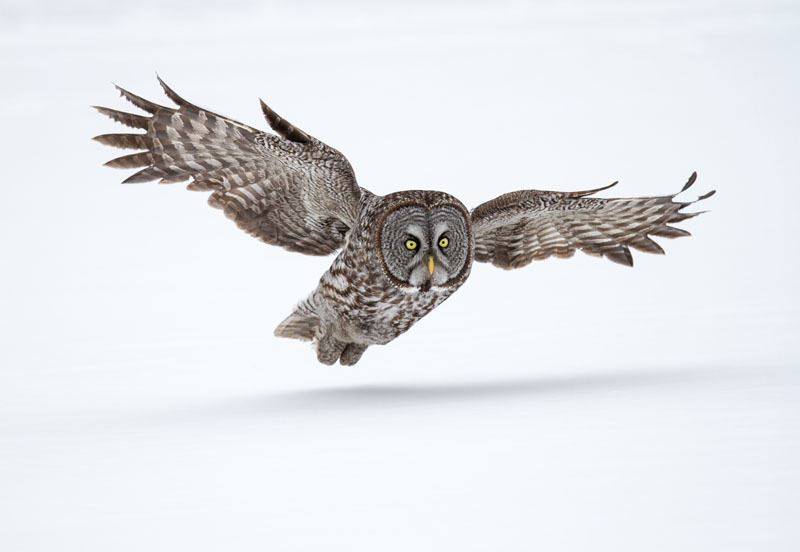 In areas where the effects of winter are predictable and consistent from year to year—which is the case for most of the country—wildlife has adapted and evolved in unique ways to survive seasonal changes while still calling Canada home. Winter brings some challenges to our vegetation. Because the upper layer of soil is frozen and there is little to no precipitation in the form of rain, plants lack the required water and nutrients for growth. Below-freezing temperatures prevent sap circulation between roots and leaves, while shorter days and lower levels of sunlight reduce the plants’ capacity to produce their own sugars through photosynthesis, which is needed for growth. For deciduous trees and shrubs—and one species of coniferous tree, the Tamarack Larch—light levels in autumn become insufficient for photosynthesis to compensate for the energy cost of producing green pigments in leaves. Red, orange or yellow pigments do a better job of using lower light levels for photosynthesis than green pigments, or chlorophyll. This is why deciduous leaves change colour when sunlight decreases and, when water levels become too low, eventually fall. The trees stay dormant throughout the winter until daytime temperatures get high enough for sap circulation to start again. This is when we tap Sugar Maples to get maple water, which is rich in unused sugars produced before the winter! Coniferous trees and shrubs have other adaptations for winter, including needles and flat, triangular, scale-like leaves. Most of these plants keep their needles during winter, which helps them photosynthesize for a longer period of time. 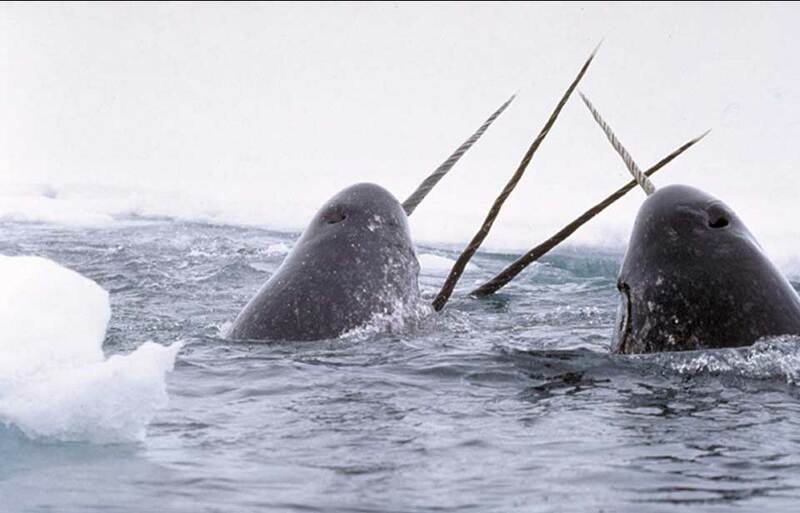 Their needles are often a dark shade of green, which may help them absorb more energy from the weaker winter sunlight. Still, conifers do not grow during the winter. 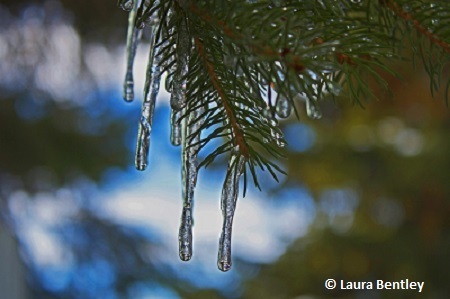 The biochemistry within coniferous needles also alters during winter and lets the plants withstand low temperatures and develop a thick, waxy coating that helps reduce water loss when water becomes scarce. The fact that conifers keep their needles throughout the year reduces the energy costs of having to regrow leaves every spring. The conical shape of some conifers is another winter adaptation; it helps them shed snow that would otherwise accumulate on their foliage and break their branches. By retaining their foliage they provide some animals with a good source of nutrients during the colder months. Other plants have different adaptations for survival from year to year. Annual plants flower and produce a great quantity of seeds before winter. They do not make it through the low temperatures and drought, but their seeds do, thanks to their tough coating! The seeds also contain energy sources that enable the plant to grow when the weather and soil conditions become appropriate. Perennial plants survive winter by the insulating properties of snow. Their roots remain living in the soil under the snow, storing energy so that when spring arrives the plant is ready to grow. 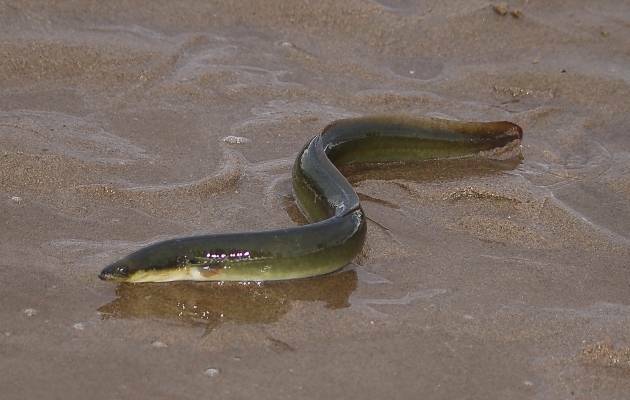 Invertebrates, like insects, mollusks, earth worms and others, are ectothermic, meaning that they cannot produce their own body heat but rely on heat from their environment. Since many species of invertebrates inhabit high latitudes, they survive by adapting to winter conditions. Some insects, the best example being the Monarch butterfly, have done so by migrating to warmer climates. 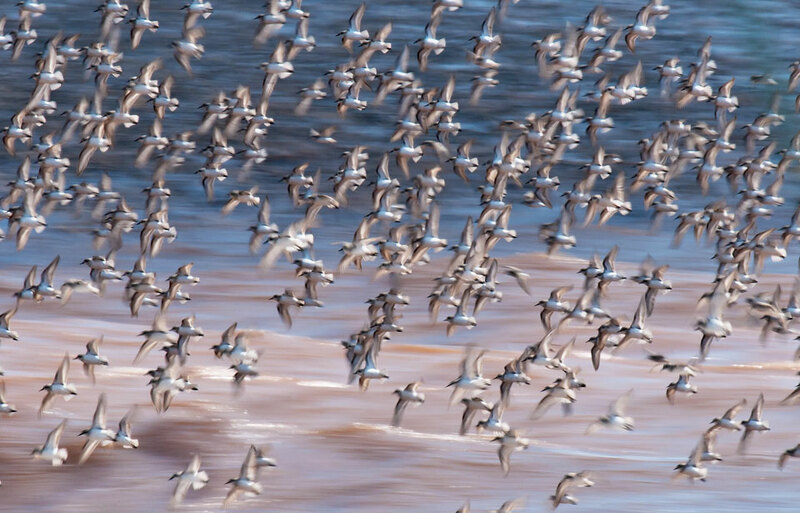 Those that cannot migrate because they cannot fly (a must for long-distance migration) or sustain the very high energy demands of such long trips have developed freeze avoidance or freeze tolerance. Both strategies involve dormancy—surviving without being active, and with much slower metabolism rates—since the animal cannot function during the winter because of cold, lack of food and dehydration. Freeze avoidance is achieved by a process called supercooling, which is accomplished by having a thick cuticle (or exoskeleton) to protect from dehydration or by changing the internal physiology and biochemistry so that body fluids do not freeze. Animals can reduce the amount of water in their bodies and produce “antifreeze” substances. 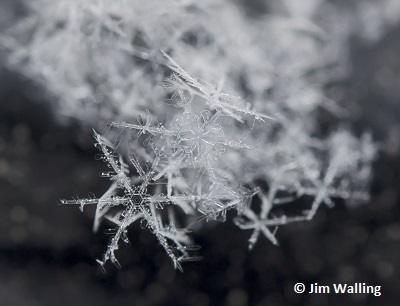 Water that isn’t pure, or that is mixed with sugars and proteins, freezes at a temperature lower than 0°C, so some species add these molecules to their fluids in the fall. 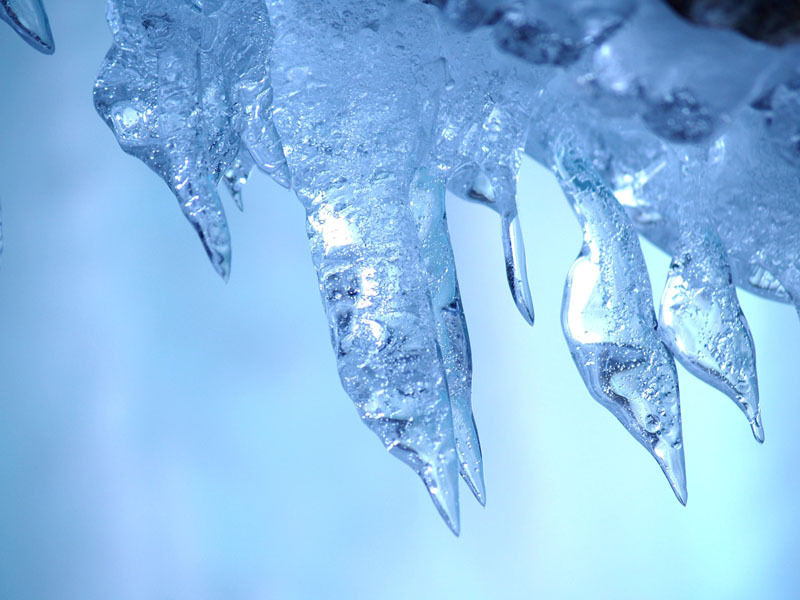 Most of our invertebrates do this; they would die if the liquids surrounding or within their cells froze. Freeze avoidance for the winter can happen at different stages of an invertebrate’s life (egg, larvae, adult, etc. ), depending on the species. Some adult invertebrates cannot survive the winter, but their eggs can, allowing the species to continue from year to year. 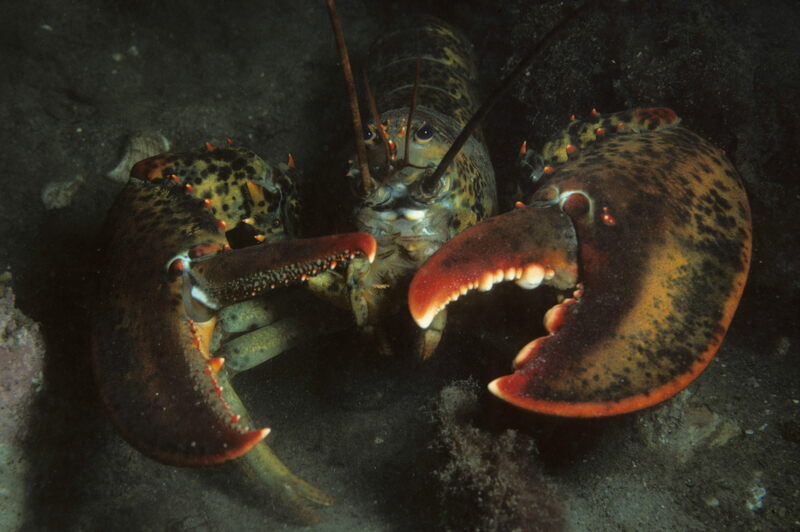 Many invertebrates also change their behaviour during the winter in order to avoid freezing: they choose a dry spot where several individuals can huddle together for warmth or, in the case of aquatic species, where they can remain in open water. Some can even lay their eggs deep underground where the soil doesn’t freeze or go dormant under the bark of the south-facing side of a tree to get more heat from sunlight! Bees and bumblebees huddle together, keeping the queen and younger individuals alive throughout the winter so that the colony survives to the next spring. 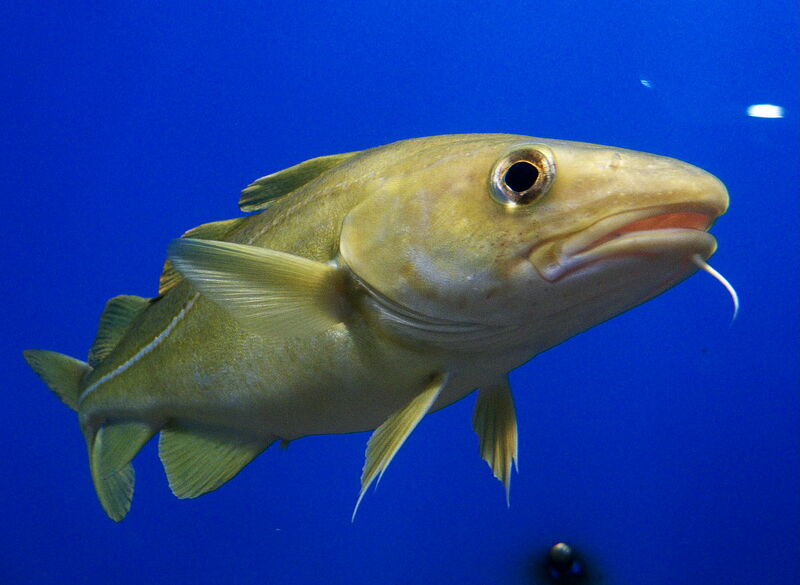 In winter, freshwater fish remain in open water under ice and snow. As ectothermic animals, they take on the same temperature as the surrounding water and remain minimally active, swimming to keep their gills oxygenated. Since water temperatures are low, and food is scarce or non-existent, they stay dormant throughout the cold season. 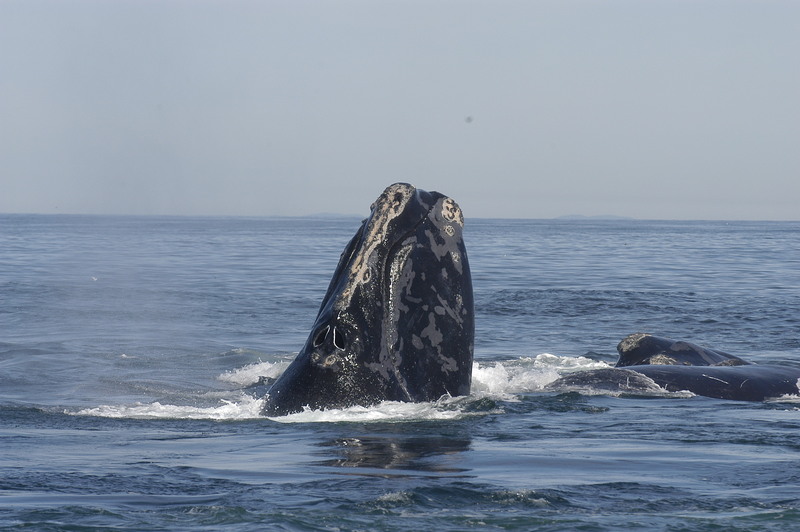 The cold slows their metabolism, and they become sluggish to conserve oxygen and energy. However, their body fluids do not freeze, as they can tolerate temperatures lower than 0°C. Amphibians and reptiles are ectothermic animals and respond to winter conditions with strategies similar to those of fish or invertebrates. They stay dormant through winter—staying mostly inactive while using their energy stores—and live in a sheltered spot, called a hibernaculum, which protects them both from the elements and predators. 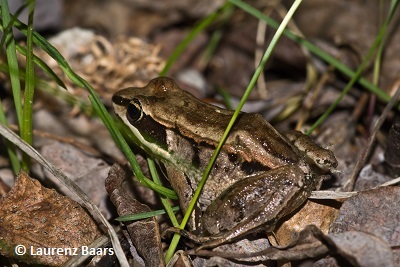 Aquatic amphibians, like the Leopard Frog, remain in the open water under ice, while other species partially bury themselves in the mud, occasionally swimming around slowly to obtain oxygen from the water. Others stay put in areas with enough dissolved oxygen to sustain them. Terrestrial amphibians go into dormancy on land. American toads and other good diggers bury themselves underground below the layer of frozen soil. Those that cannot dig very deep, like the Wood Frog and Grey Tree Frog, find a hidden spot under fallen leaves or on logs and trees, leaving them susceptible to frost. To cope, they have developed freeze tolerance, and as long as some vital organs remain free of ice crystals (thanks to high concentrations of sugars), they can thaw and survive even if their heart and lungs haven’t worked for many months! However, they still need an insulating snow cover over their bodies; if temperatures were to drop below a certain point, they would not survive. 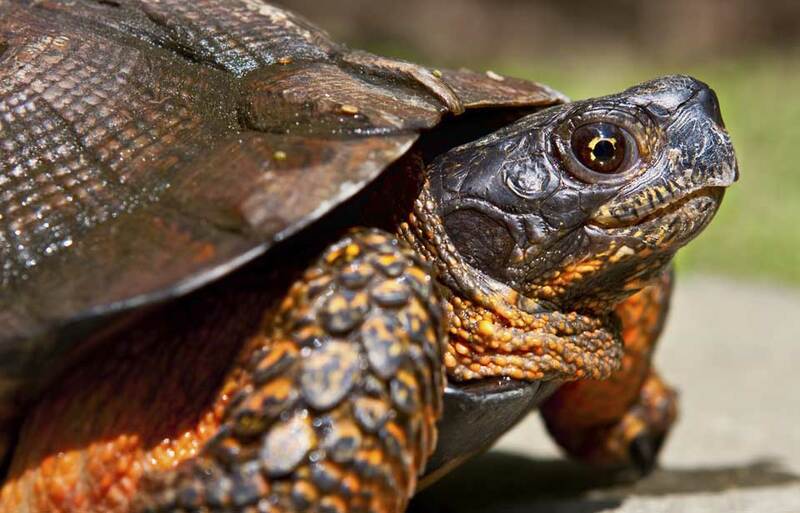 Unlike some amphibians, reptiles are not generally freeze tolerant, and must therefore find a way to prevent ice from forming in their tissues. Their activity levels are greatly reduced in winter and so, similar to amphibians, they stay dormant in sub-zero temperatures. As a solution, Garter Snakes and some other species of snakes have hibernacula deep in the soil where they group up and huddle to conserve heat. Since these hibernacula are few and far between, some individuals migrate to reach them in the fall. 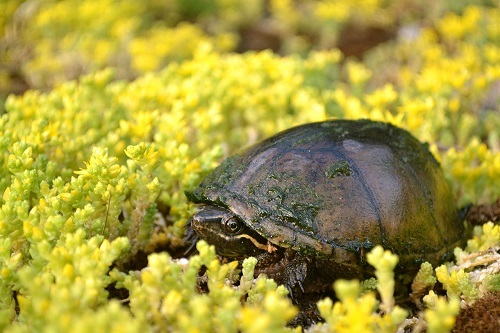 Another adaptation by freshwater reptiles such as Painted Turtles, which do not need much oxygen to survive, involves burying themselves in the mud at the bottom of lakes and ponds. 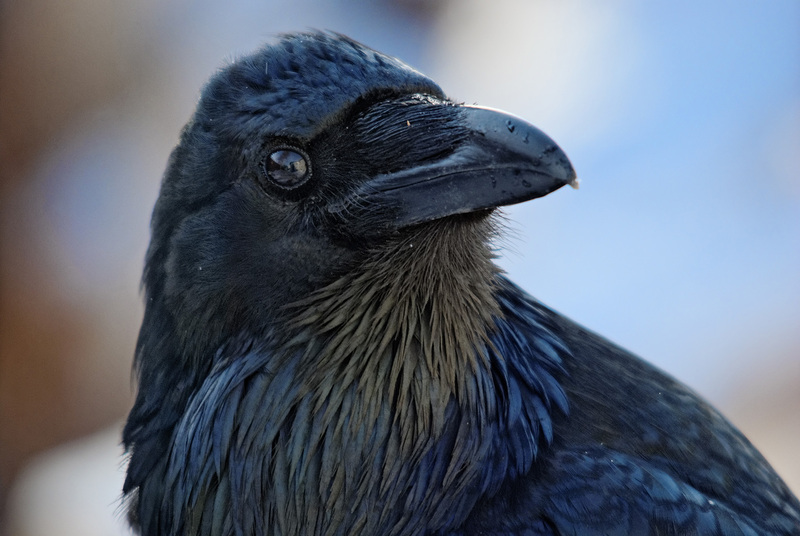 Birds are endothermic animals, meaning they produce their own body heat (feathers probably evolved as insulation to help retain warmth) and are generally highly mobile. This makes their winter adaptations very different from ectothermic animals. 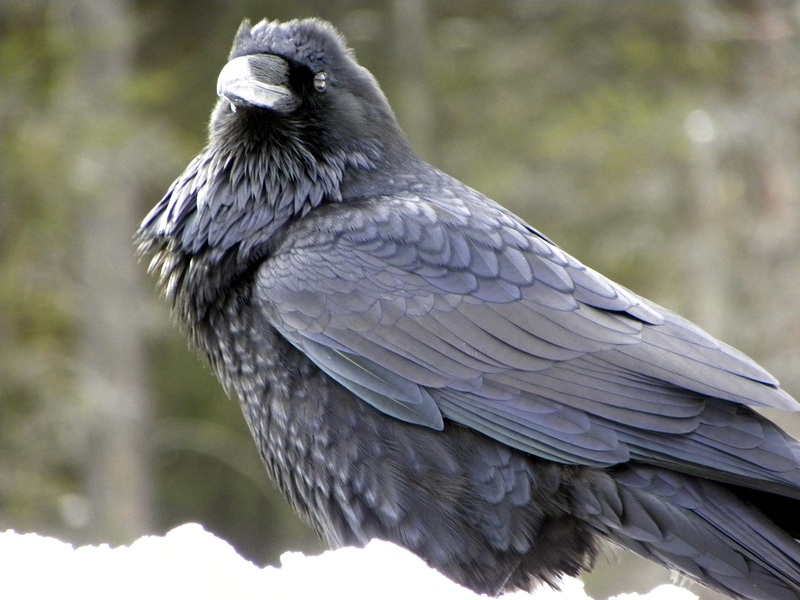 Because of their high metabolism, birds cannot hibernate. Thus, searching for food is a major issue since they must maintain their body functions and activities during the winter months. 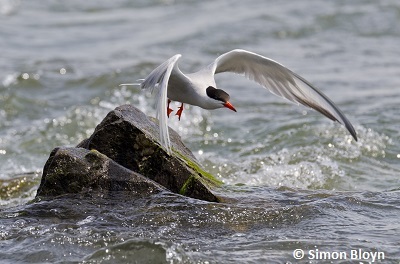 Finding suitable habitat for the winter months is another priority for birds, as low temperatures, snow and ice-covered water ecosystems can inhibit survival. 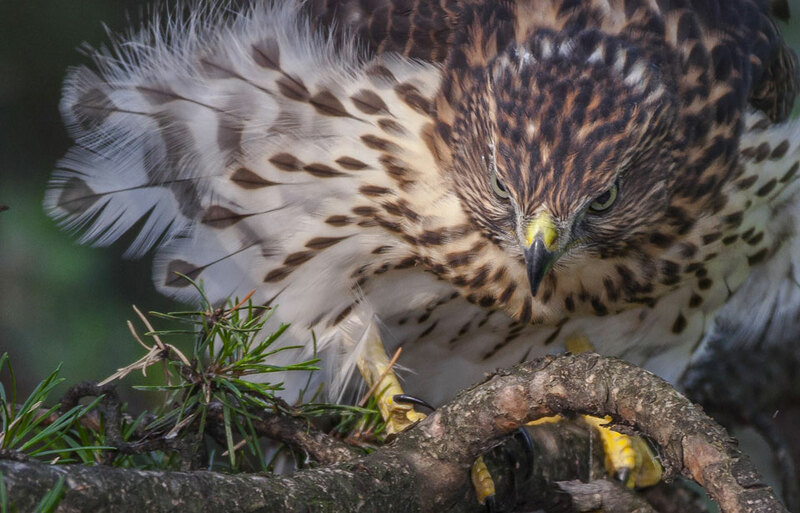 For those species that cannot find food or habitat in our high latitude, like the Snow Goose, the Piping Plover, the Bald Eagle (except in coastal areas) and the Red-winged Blackbird, migration becomes necessary. 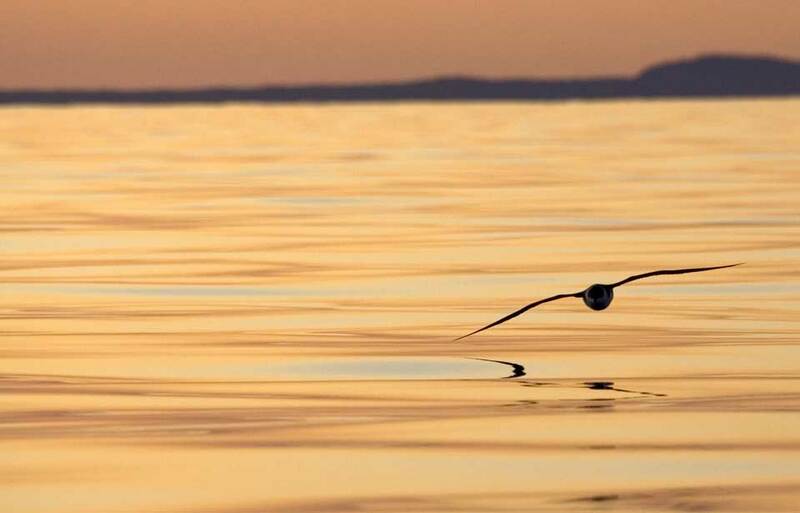 Even if the energy costs of migration are high—flying for such long distances not only takes a lot of energy, but it can also be very unpredictable—it is still the only option for certain species. Some species like the Snowy Owl migrate within Canada, leaving their summer tundra habitat for warmer grasslands and boreal and mixed forests, where food is more readily available. 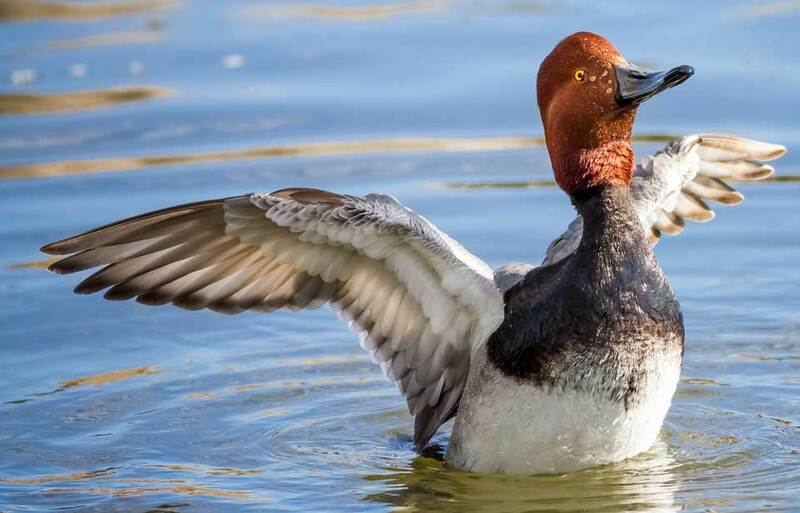 A great number of birds have evolved to remain in Canada throughout the year. Many flock together, sometimes with other species, and huddle to help retain heat. This also reduces the need to watch out for predators. 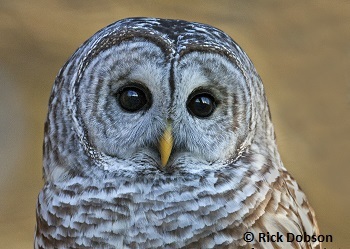 Most remain active by feeding on nuts, dried fruit, seeds, twigs and branches in the vegetation. Many of these species flock to bird feeders, where they supplement their diet with fatty items. 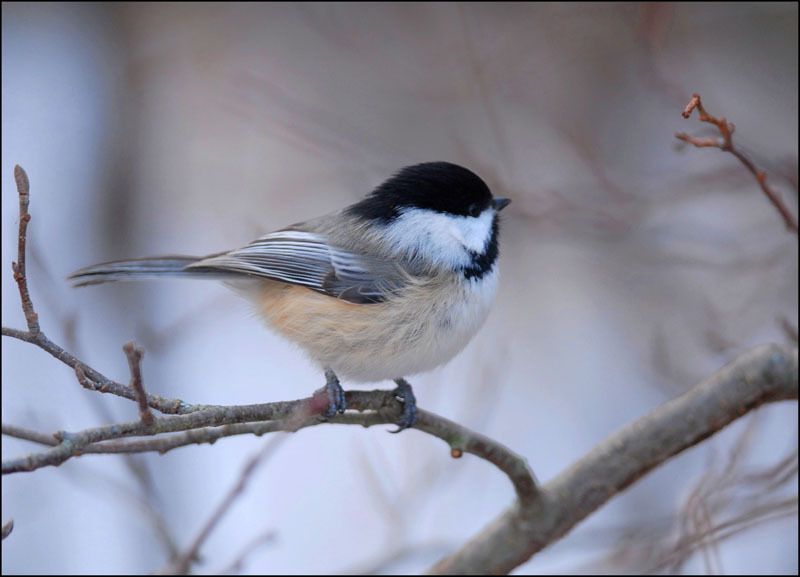 These birds include the Black-capped Chickadee, the Blue Jay, the Northern Cardinal and more. 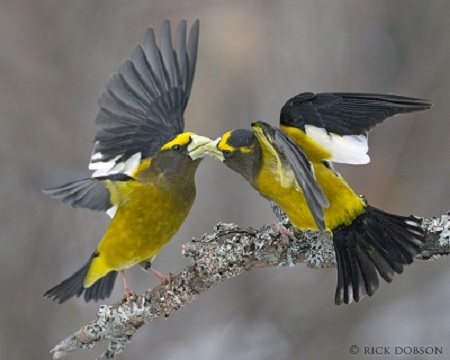 Many, like the Evening Grosbeak, have strong beaks, which helps them crack seeds and nuts. 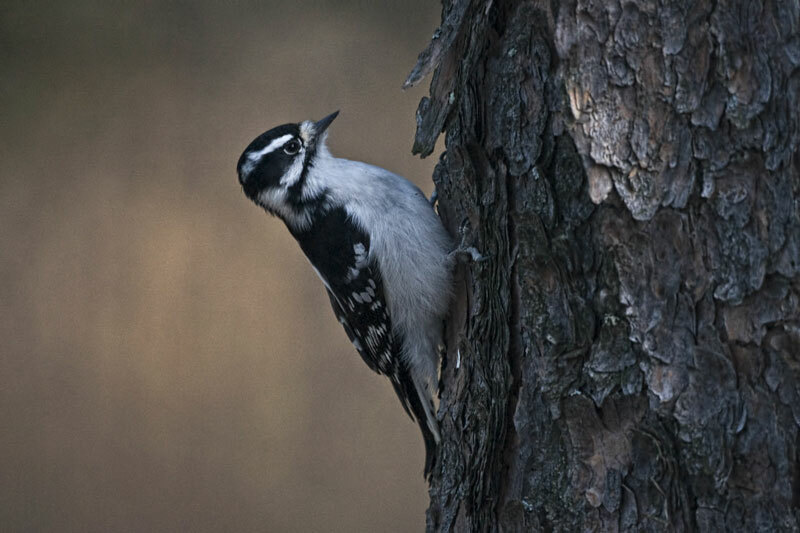 Some species, like the Downy Woodpecker and the Red-breasted Nuthatch, feed on dormant insects and invertebrate eggs under tree bark, but they can also be spotted at bird feeders. 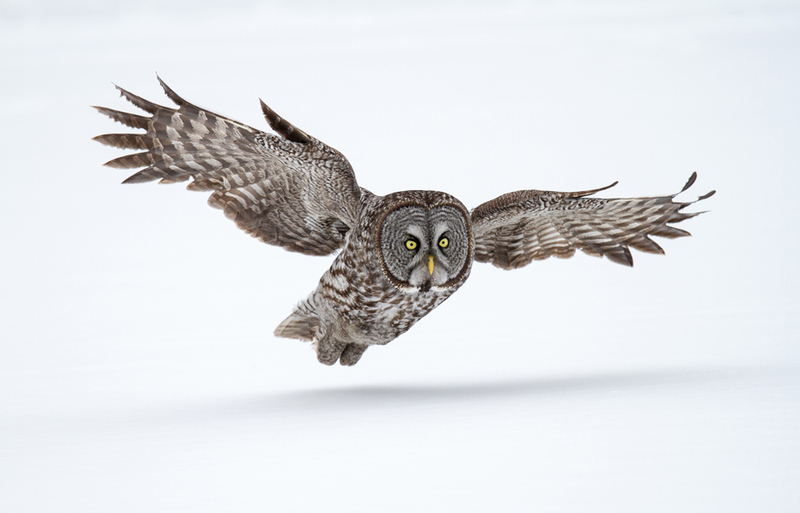 Birds of prey that winter in Canada, like the Barred Owl and the Great Horned Owl, are equipped to hunt in winter conditions and can hear small mammals under the snow. 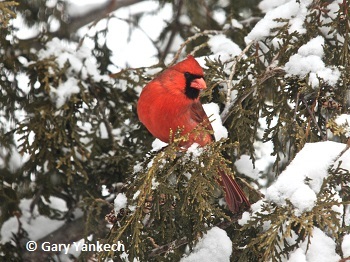 Most birds that winter here find shelter from winds and predators in coniferous trees and dense shrubs. Some, like the Ruffed Grouse, use thick snow for shelter. As grouse are unable to fly for long distances, they grow feathers on their feet that act as snowshoes and help them to stay mobile. 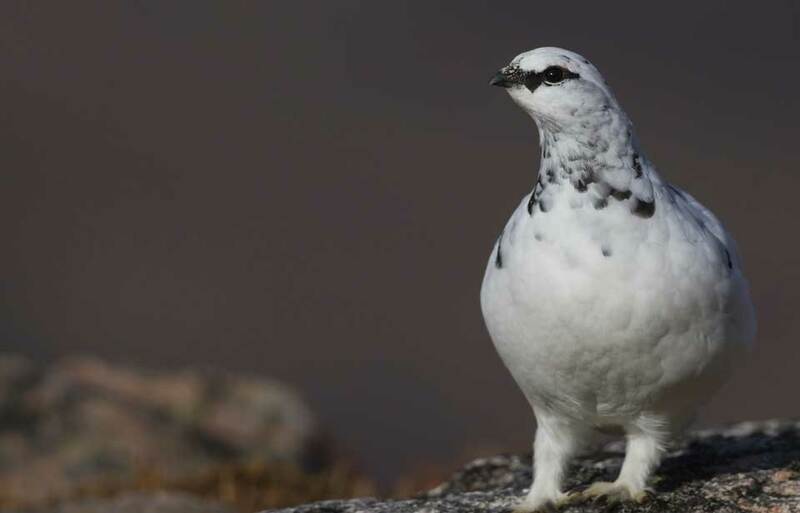 Some birds like the Ptarmigan, which don’t have a high flight capacity and remain on the ground most of the time, turn completely white during the winter. This allows them to hide from predators. A few species of aquatic birds, like the mallard, can remain in Canada during the winter as long as they find open water habitat, including in urban areas. 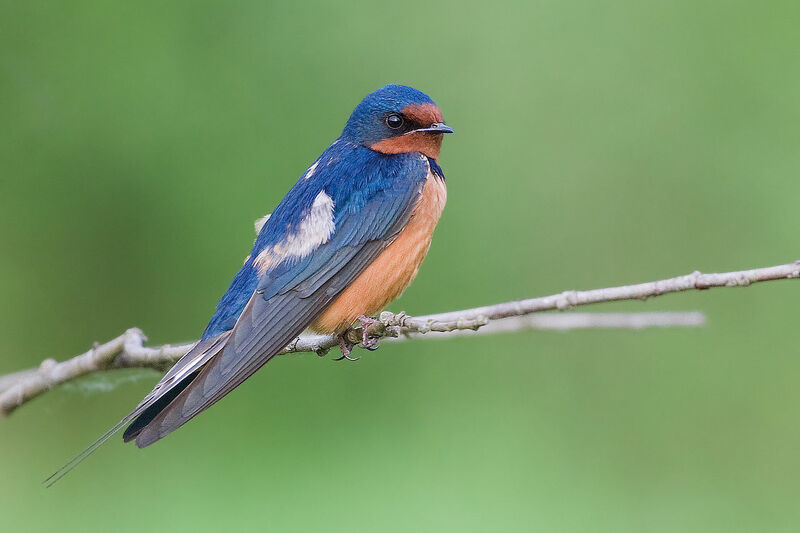 Mammals, like birds, are endothermic, meaning that they must sustain their metabolism in order to keep their body temperature high enough for survival. 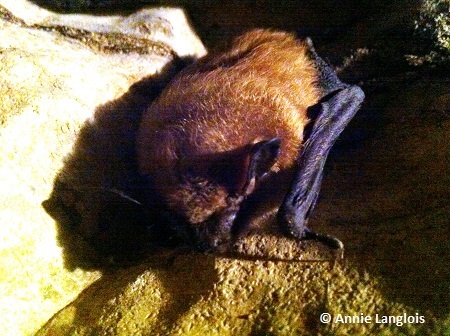 But unlike birds, some mammals can hibernate. When in hibernation, animals have low body temperatures and slow breathing, heart and metabolic rates. They typically hide in a shelter away from predators to avoid the need to wake up in a hurry— waking and returning to hibernation is very energy costly, though some animals do spend winter alternating between these two states. 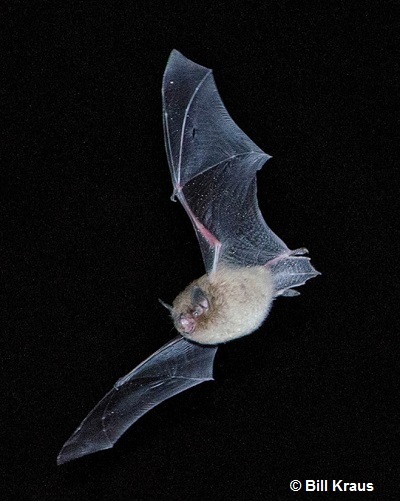 Only a few species can hibernate efficiently, as it means surviving on limited fat resources for an uncertain length of time, but species like the Chipmunk, the Woodchuck, the Black Bear and some bats (like the Big and Little Brown Bats) have been able to adapt to winter by doing so. A few terrestrial mammals migrate in the winter to areas with greater food availability and better conditions for survival. 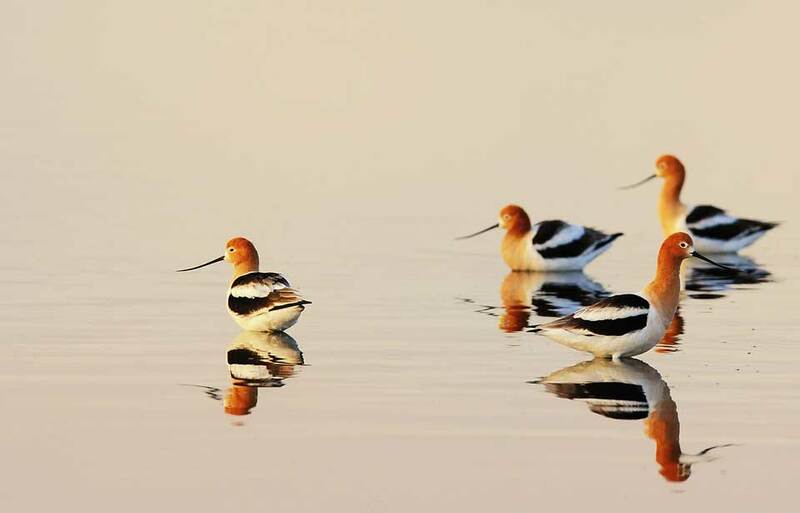 Since most mammals walk, they do not migrate as far as birds. The Barren-Ground and Woodland Caribou have seasonal migration patterns from their summer tundra habitats to more sheltered areas in the boreal forest, where they are better protected from the elements. 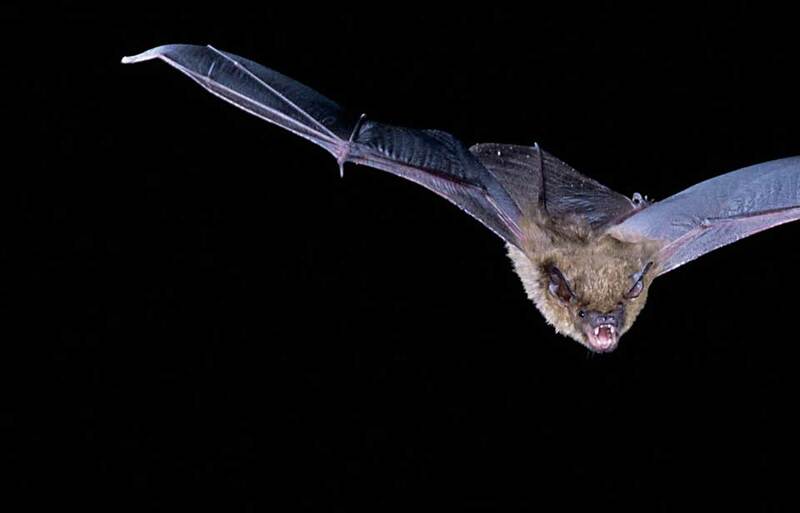 Some bats, like the Little Brown Bat, migrate seasonally within Canada to buildings or caves, but others, like the Red Bat, the Hoary Bat and the Silver-haired Bat, migrate farther south to areas in the United States. Most Canadian terrestrial mammals have evolved to stay put throughout the year and stay active in our northern winters. To survive the snow, drought and cold, they have several interesting adaptations. Some species grow thicker winter fur in the fall, which for some is completely white. 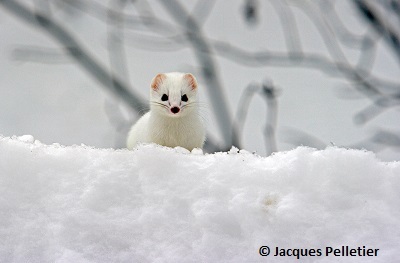 This helps the snowshoe hare and ermine, for example, to stay warm and hide from predators. To help with mobility, many mammals, including the caribou, our two lynx species and the Snowshoe Hare, have adapted to walk in the snow. 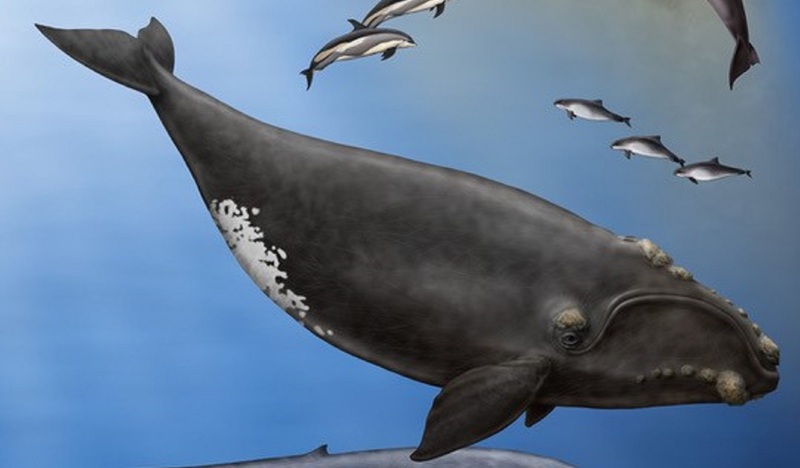 They can have rather large feet compared to their body size, and their feet function a bit like snowshoes so they do not sink too deeply into the snow. The moose and bison have adapted to have very strong legs, with muscles that are made to lift their feet in deep snow. In order to survive, mammals that stay and don’t hibernate must find food and shelter during the winter. 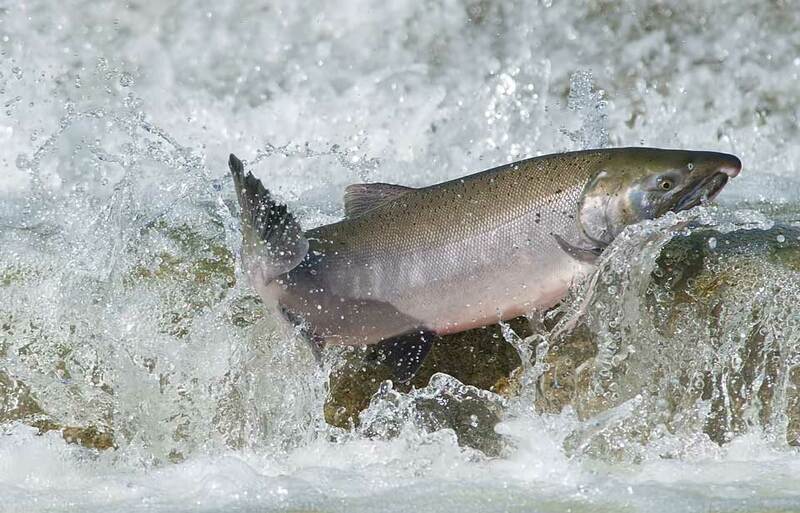 Most active mammal species need to change their diet seasonally, as some food is unavailable year-round. 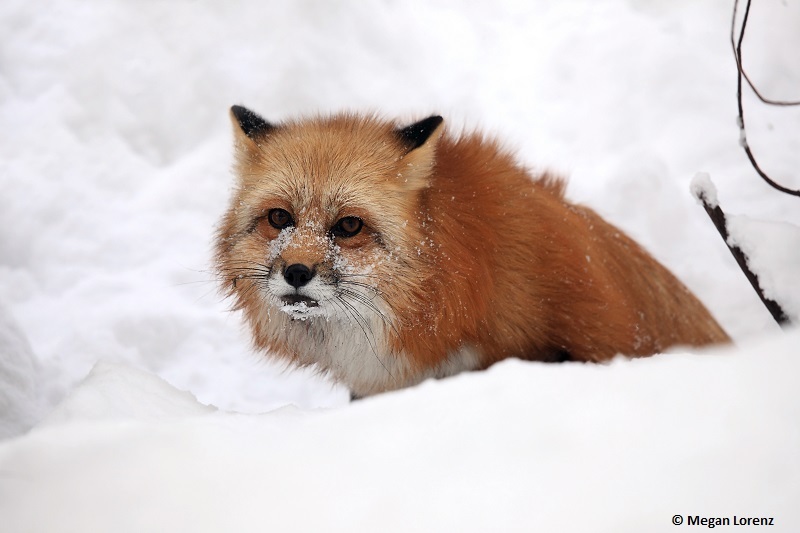 For example, the Red Fox only eats small mammals in the winter, since there are no berries or insects. The White-tailed Deer, unable to rely on leafy material during the cold season, eats twigs and buds. Some species change their methods of feeding seasonally. To ensure that access to food remains, the Grey Squirrel, Beaver and others store food for later. The Wolverine uses its powerful neck and jaw muscles to crunch on frozen bones it finds on scavenging trips. Like finding food, finding shelter in the winter is more difficult than in the summer. Still, species like mice and voles have come up with creative adaption, digging holes in the snow and ground where they huddle together for warmth in burrows. They can even stay and forage in the warmer layer of air trapped between the snow and the ground. Mammals will use the coniferous vegetation, dens, holes in the trees, etc. to hide from the bitter winds. 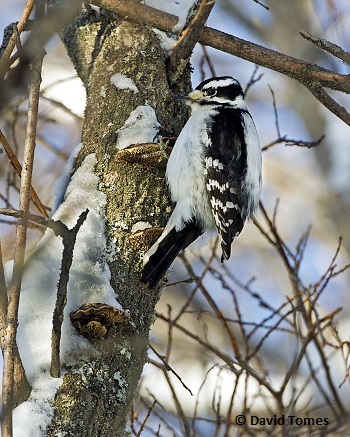 The winter is a great time to enjoy our natural spaces and observe our wild species. Dress appropriately, put on your snowshoes, good boots or cross-country skis, bring a pair of binoculars if you have them, and you’re all set! 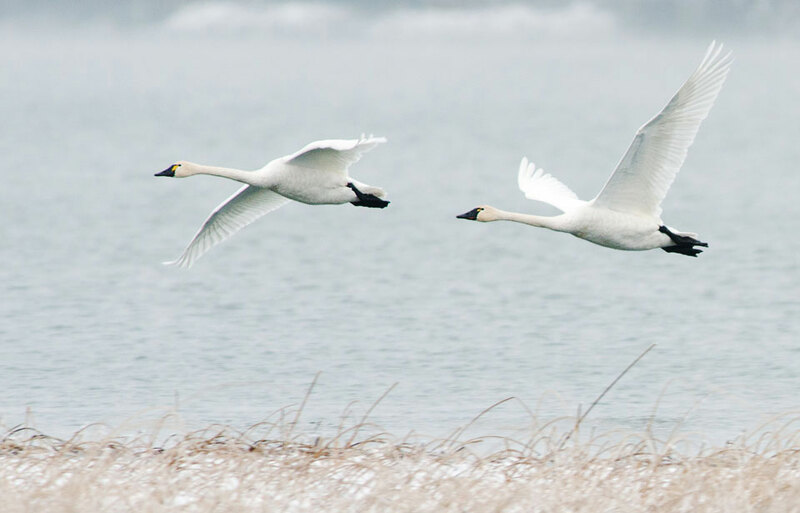 Spotting active animals is actually easier in the winter than in the summer. The absence of thick foliage gives people a better chance to observe and hear animals from a distance, and tracks in the snow makes it much easier to determine which species are active. Footprints are common, but you might also see wing prints, since birds of prey will lunge down in the snow to get to prey. 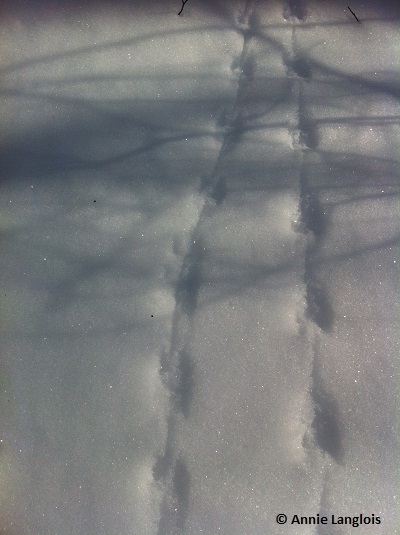 An experienced observer can tell not only what species have left these tracks, but also whether they were running or walking when they left them. Animals can leave other signs of their presence too. Look for leftover pine cones, bark, seeds or small animal carcasses on the ground, as squirrels, porcupines and birds may have left them behind. You may also see tunnels dug by voles or other rodents. During your outings, make sure to stick to trails and avoid caves and burrows so that you don’t disturb hibernating wildlife. 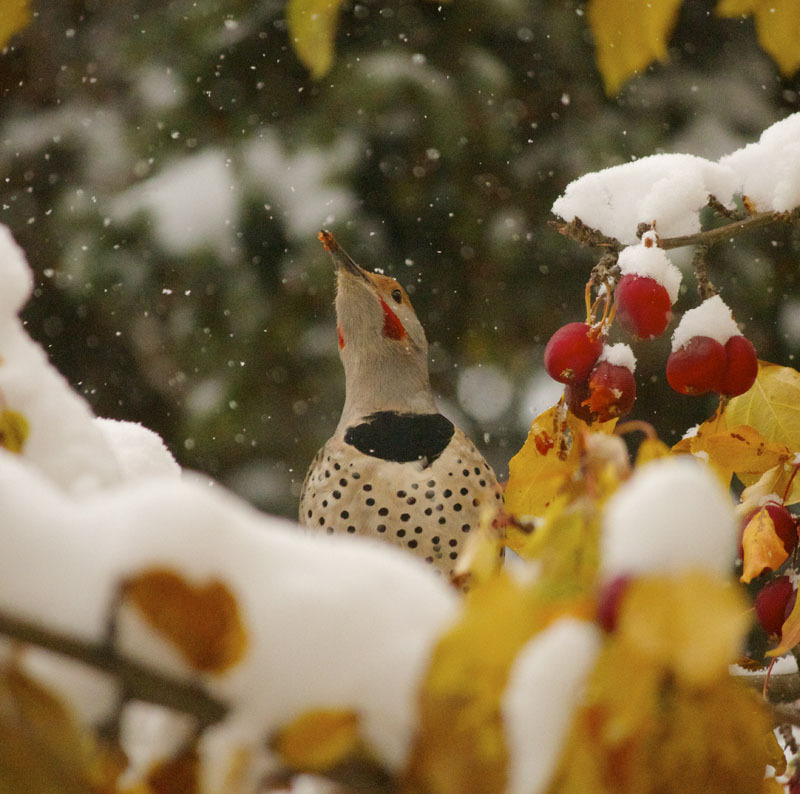 To observe birds and small mammals in your own backyard, garden with native plants, as they might offer interesting food or shelter for wintering animals. You can also set up a bird feeder, but make sure to first get information on how to assemble it properly and what types of seeds you should use. 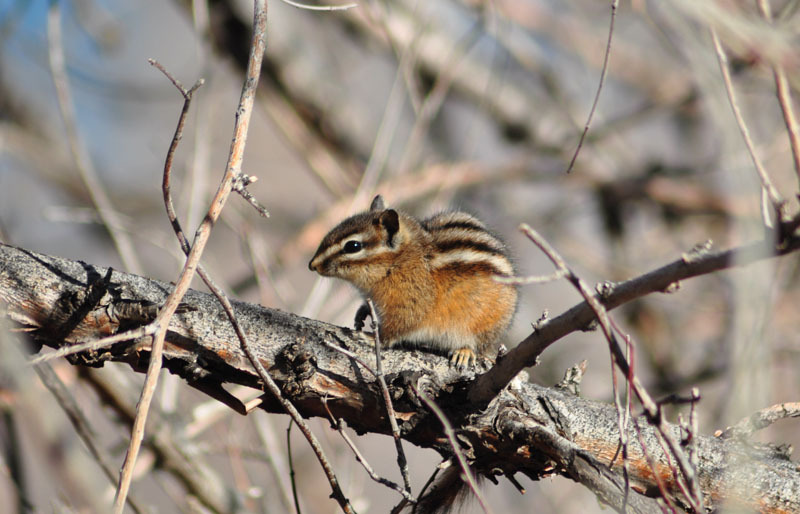 Winter is a great season to get out and enjoy wildlife! As always, leave nothing but your own footprints behind you. © Her Majesty the Queen in Right of Canada, represented by the Minister of the Environment, 2013. All rights reserved.